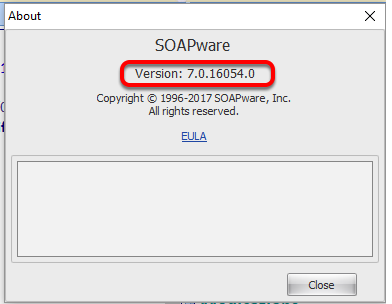 SOAPware DocumentationSOAPware FAQ'sFAQ's MiscellaneousQ: How can I tell what version of SOAPware I am running? A: SOAPware currently has different versions and within those versions are different builds of SOAPware. 1. Click on Help on the menu bar. 2. Click on "About SOAPware." 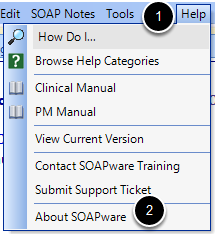 A dialog box will appear with the current version and build of SOAPware. Previous Lesson: Q: How do my nurses let me know when a patient is ready to been seen? Next Lesson: Q: Can I run SOAPware on a Mac computer?